Holy cow modelers! This is a monster model! I know, the Anigrand Galaxy is a bit bigger but the fuselage comes in sections and it does not provide the same visual impact upon opening the box. 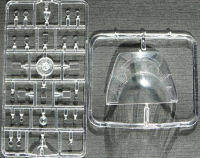 The main parts are epoxy fiber but what a huge departure from what we are used to seeing from the Amodel Amonster series. The surfaces are shiny, free of blemishes and without pinholes. All the fiberglass parts were wrapped individually in saran wrapofski to protect them from scuffing. 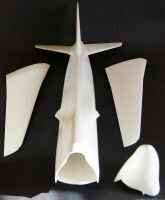 The tail and the tail wings were attached to the fuselage for the picture taking but they come as individual parts with inserted tubes as guides. The nose section comes as a separate part and presumably an interior will be offered down the road maybe. The main wings are beautifully molded but they do not have any droop dialed in them. Metal tubes are provided for attaching the wings to the fuselage. 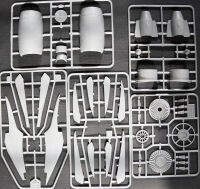 All the rest of the parts are molded in plastic and they look very good, flash free and in general much better than what Amodel has us used to. The cockpit is very complete with all the crew accommodations (pilot, copilot, navigator, senior flight engineer, flight engineer and radioman). The top of the fiberglass nose section would have to be cut and replaced by injected plastic and clear plastic, so some surgery is required to show off all of that good stuff. 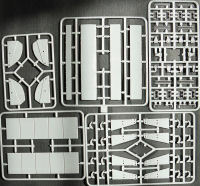 The landing gear is well represented with a huge number of sprues for the front and main landing gear. I did not see any mention of nose weight but I feel that this model will be a tail sitter with all the fiberglass weight from the tail and tail wings. Personally, I do not care since I am hanging mine next to my other monster transports. The engines are very nice looking a with many parts and lots of detail. With some smart painting they will look great. The instructions are great with painting references everywhere. They appear to be CAD derived. One other most amazing aspect of this kit are the decals. We are talking about tablecloth size decal sheets! I mean who has printers that can do that stuff! Great colors, in register and legible. I hope they go down just as well. The schemes are very good looking and you will have trouble choosing one. 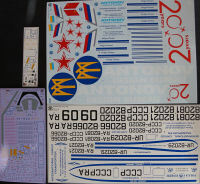 I think I will go with the Soviet Union scheme to match my collection. This is a spectacular kit that looks to be very accurate in all of the details I can see from photos of the real thing.